Want to know a kind of funny secret? I’d never, until this week, bought a fennel. I don’t really know why I asked for two, last Sunday, at our market’s organic produce stand. These awkward whitish bulbs were just piled there, kind of like beady fish eyes staring at passersby. It was what you’d call an “impulse” buy. By the time the young lady helping me had weighed them, it was too late- fortunately. Since I’d never bought one, I’d never cooked with one either- until today. What an aroma fills the room as you slice into it! A sort of fresh, playful licorice. 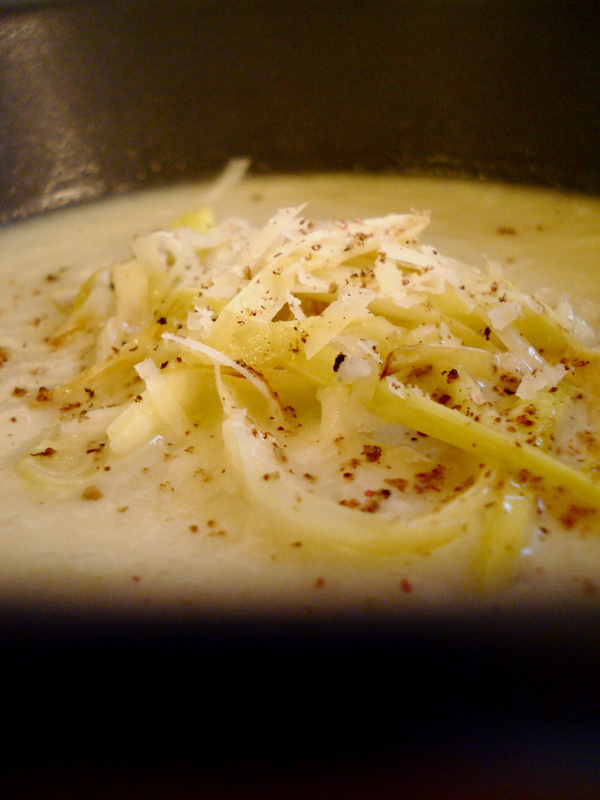 I made my two bulbs into four bowls of creamy fennel leek soup. We finished it off about half an hour ago, but I really wish we had more. I was inspired by a “velouté” that I found in one of my French cookbooks. 1. Prepare the soup: Sauté the fennel and leeks in a bit of olive oil, until translucent (like onions). Cover with water, add the bay leaves, sprinkle in some salt and grate in a dash of nutmeg. Cover and let simmer (medium heat) until the fennel is fully cooked. 2. Prepare the cream: In a small bowl, combine the crème fraîche with the lemon juice and let sit. (If using sour cream, do not add the lemon). 3. Prepare the leek topping: Slice the remaining 1/2 of a leek into small strips. Gently sauté them in a small amount of olive oil. Cook them very slightly, stirring regularly and removing them from the heat before they turn brown. Set aside. 4. Blend and combine: When the vegetables are cooked, blend them until “smooth” and then return this mixture to the pot. Add the cream and the Parmesan. Top with the leek strips, a bit of Parmesan, a grate of nutmeg and some pepper. Serve with thick slices of fresh, grainy bread (perfect for dipping). This entry was posted in Recipes (All), Recipes (Gluten-free) and tagged soups, vegetables. Bookmark the permalink. So glad you found it…..this is one of my favorite “secret” ingredients. I add it to almost all my soups and stews and freshly sliced and marinated in the salad dressing before tossing with other ingredients and lettuce. It tastes great with apples. Richard from Netherlands, August 10, 2012 at 6:46 PM Echt geweldig, fantastisch, heerlijk, fijn, verrukkelijk, relaxerend, kortom een top hotel ! Geheel in de authetieke sfeer van het geweldige Gardemeer. Werd zelfs ontroerd toen ik voor het eerst door de ruimtes van het hotel liep.